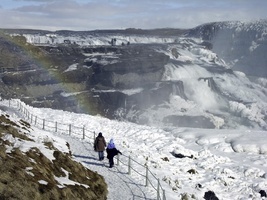 This short winter self-drive tour focuses on the highlights of South Iceland, Volcanoes, Glaciers and Northern Lights. Explore amazing Icelandic landscape with its volcanic lava fields, powerful waterfalls, spouting hot springs, and black-sand beaches. 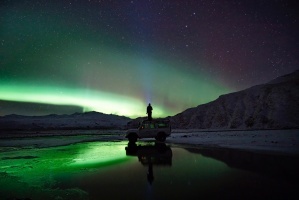 In the evening search the dark Iceland skies looking for the magnificient Northern Lights. Pick-up your rental car at Keflavik International Airport. 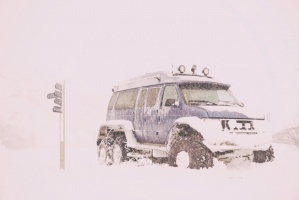 Drive to your hotel in Reykjavik. Spend the afternoon exploring the city center of Reykjavik, perhaps visiting a few museums or just enjoy a drink with the locals in one of the many pubs in the down town area. Overnight in Icelandair Hotel Natura. Visit the must-see sites in Iceland! Start with Thingvellir National Park, famous for its history and geological wonders. Continue to Geysir hot spring area with its bubbling pools and spouting geyser. Onwards to the majestic Gullfoss waterfall. Overnight in Fludir Icelandair Hotel. Options: Geysir Geo Center, afternoon/evening visit to Fontana Baths at Laugarvatn. Drive along the scenic south shore and across the area around the infamous Eyjafjallajokull stratovolcano. Onwards viewing the beautiful Skogarfoss and Seljalandsfoss waterfalls and the black sand beaches around Vik and Myrdalsjokull glacier. 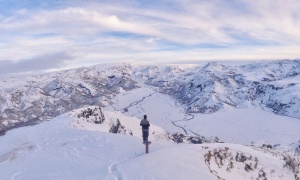 Stop in the charming village of Vik and an overnight stay. Overnight in Icelandair Hotel Vik. There is an option having a riding tour in Hveragerdi. Drive to Reykjanes peninsula and the famous Blue Lagoon for a relaxing dip in the pleasantly warm geothermal waters, rich in silica and minerals that are great for the skin. Explore Reykjanes Peninsula or simply head to your hotel, relax at the spa or explore Reykjavik, the northernmost capital in the world. Overnight in Icelandair Hotel Natura. Drive back to Keflavik International Airport and even stop at Blue Lagoon if you liked it the day before, as it is on your way to the airport. 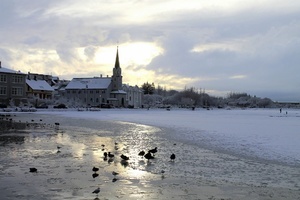 2 nights at Icelandair Hotel Reykjavik Natura or similar, including breakfast. 1 night at Icelandair Hotel Fludir or similar, including breakfast. SIM card worth ISK 2000: unlimited minutes of local calls + 1GB of data. Standard, Micro and Nano cards available. Please check with your service provider to make sure that your phone is unlocked before arrival in Iceland. *In case of no availability at Icelandair Hotel Natura, Icelandair Hotel Vik, or Icelandair Hotel Fludir we reserve the right to book a equivalent hotel. 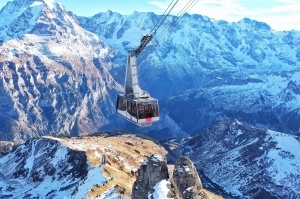 Detailed itinerary created specially for your travel route where you'll find information on must-visit sights along the way, interesting detours, and other important tidbits that will help to make your travels easier and more enjoyable. 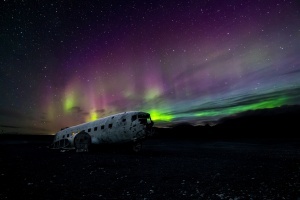 Even though the tour is relatively short, you have the opportunity to explore all of Iceland's main attractions in Golden Circle area as well as along and around the South Shore, and with a bit of luck to enjoy the stunning view of the gliding Aurora Borealis. Electronic version of Iceland Travel Booklet. Prior to your arrival we will send you an electronic version of our Iceland Travel Booklet. You can start preparing yourself for your upcoming Iceland trip and be all ready for you Iceland adventure! You will participate in a Northern Lights Boat tour with an expert guide (on your arrival evening), where you will gain some tips on how to see the northern lights. You can use that information during the next evening where you will be hunting for the northern lights on your own. Possibility of visiting the famous Blue Lagoon. Safety first! Free sim card worth ISK 2000 to phone us in case of any hiccups and in case of emergency. It also gives you the opportunity to phone your friends and family at home and share your Iceland experience through social media. If you like the day-to-day itinerary for our Volcanoes, Glaciers, and Northern Lights self-drive tour but are looking for a more budget friendly option we recommend that you take a look at our Volcanic View and Northern Lights self-drive.